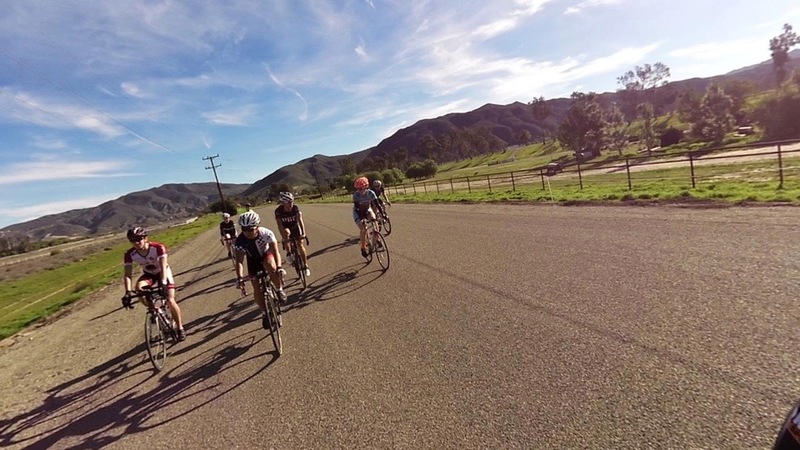 “On day 5 of training camp it was time for the TTT practice, and the much anticipated mock race (the Kool Katz were itching to redeem ourselves after our dismal performance during trivia night, and I was waiting to break out my skinsuit – because “aero is everything”). We started the day riding some beautiful roads that we had enjoyed early in the week during a recovery ride. The road rolled through farmland, affording some spectacular views – we then dropped down off of the mountain and into the valley where the “flat” road we would practice TTTing on was located. We were eight on the day, four men and four women, so we split into a men’s team and women’s team and set off. I was riding with collegiate ITT national champion Erik, the incredibly strong and full of boundless energy Berk, and the massive diesel engine most call “Miles” – needless to say my legs were getting ripped off from the start. We did two practice 10 min TTs, and by the end I was absolutely toasted, I had used everything I had in the legs – but I wouldn’t have traded it for good legs for the rest of camp. There is something special that happens during a TTT; massive speeds, teammates working in harmony, and smooth and seamless conservation and economy of motion. When it all comes together it’s a beautiful thing. While we were far from having it come perfectly together, we still were able to tap into a little of that feel and that magic. Taking a break between Team Time Trial (TTT) efforts to strategize. “Ever since I’d seen the 109-mile ride in the schedule for WTC, I’d been afraid. Not only was this a ride at the end of many days of hard riding, not only did it include 11000 ft of climbing, this would be the longest ride I had ever done. Making it through the previous rides at WTC boosted my confidence a bit, but the night before I also knew that my body was fatigued from the 300+ miles we’d ridden in the previous few days. A small part of me was tempted to take the “easy” option skipping part of the main climb and doing “only” 90 miles, but I wanted to take on the challenge and be a part of the entire team making it through this crazy ride. Ready to roll out for the century! After a filling breakfast, my group headed out, enjoying a lengthy ~35 mile downhill section with some fun speedy descents. There was a brief relatively flat section, then we started the 35 mile climb that would make up the middle chunk of the ride. After zipping along at 20+ mph, it was hard to not feel frustrated by the <10 mph slower pace climbing up the hills. The sun was beating down, and I quickly began to overheat. 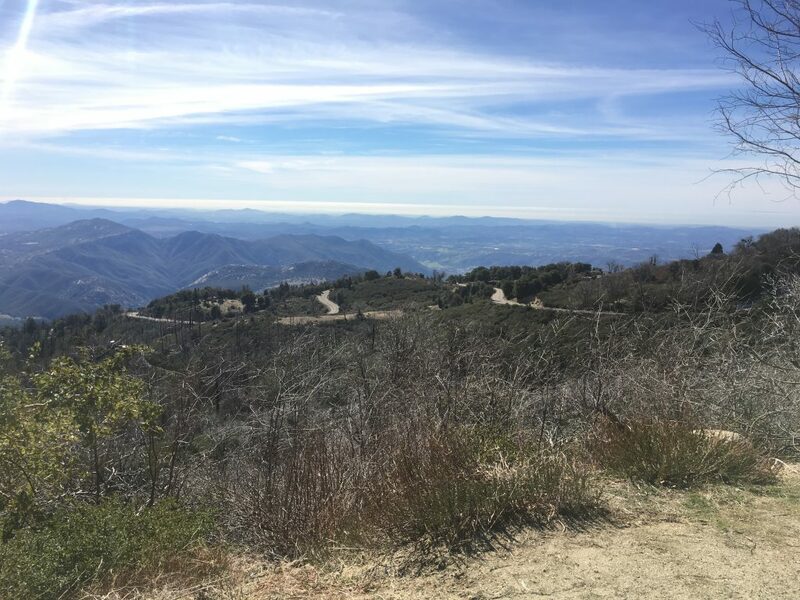 We were only 10 or so miles into the climb, and less than half way done with the ride – to feel so challenged at this point really started to get me down. However, a brief pause to de-layer, drink some water and eat some sugary food (PopTarts for the winning ride snack!) made all the difference, and the next 10 miles flew by. As we took a quick break at mile 66, the weather started to cool and clouds started to roll in. 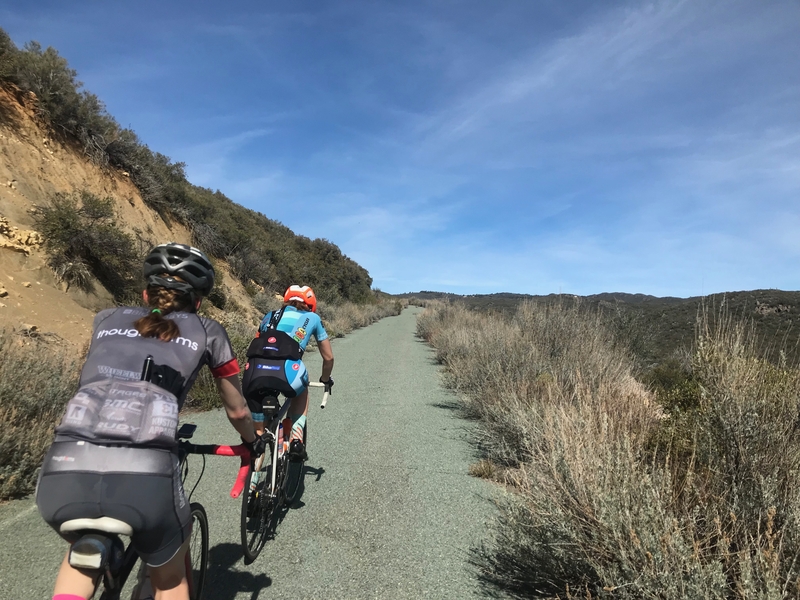 We rolled out, eager to attack the last part of this climb by summiting Mount Laguna, this time from the paved road side. Lee and I were pacing ourselves and feeling pretty good about the smooth pavement, consistent grade, quiet road, and beautiful views, when I glanced down and noticed that my front tire was looking awful squished out at the bottom. We both pulled over and confirmed that I must have a small leak leading to the low tire pressure. We swapped out the tube, doing our best to both check the tire and rim but without finding the cause of the leak. Reinvigorated by the small break, we pushed the pace on the next part of the hill, but a few miles later I noticed my front tire was squished out again! A second stop, a second check of the tire and wheel, a second tube swap – and at a higher elevation, I was starting to get pretty cold. Amy and Dmitro came back down from the summit to keep me company, and we all hurried up to the top to meet the group and start the descent (and get back to the house before dark!). 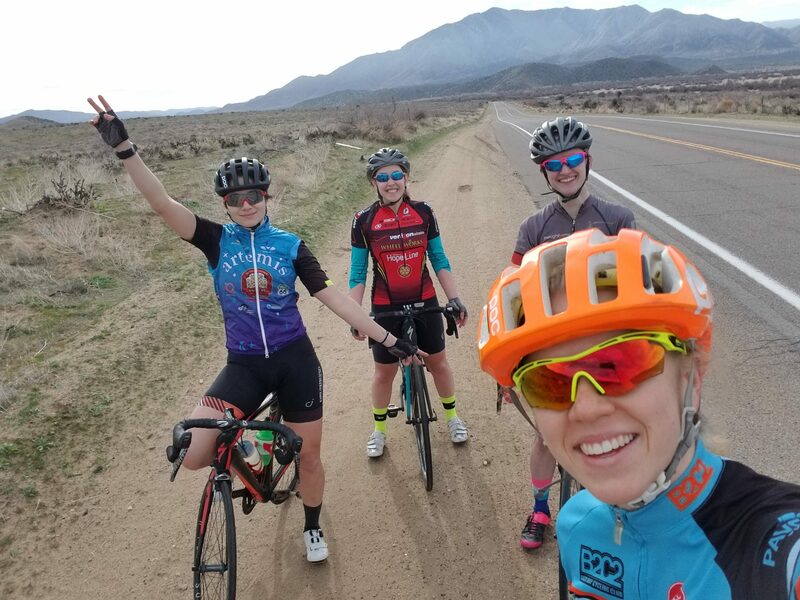 “On the last day of training camp, four of us (Stan, Amy, Miles, and I), packed up the minivan with our bikes, and drove into the desert in an effort to avoid the rain that was forecasted to hit Santa Ysabel and the surrounding area. We parked the van at Agua Caliente Park, and set out towards Ocotillo. 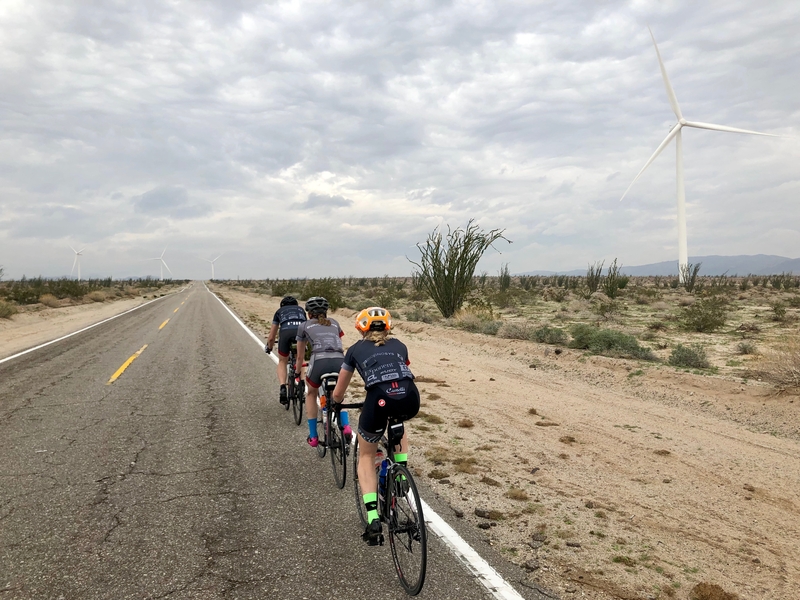 In terms of the amount of climbing per distance traveled, this was by far the flattest ride of training camp, with only 2500 feet over 50 miles, and we pacelined the whole way to Ocotillo. The ride offered vast views of the desert and mountains, and it was fun to be in such a remote and beautiful area that had minimal car traffic. The turnaround featured an unexpected cyclocross adventure, where in an effort to make the route more “interesting”, Amy had planned a small square loop that turned out to contain a road that was made entirely of sand. Stan and Miles had conveniently missed this final turn, and enjoyed watching Amy and I pathetically struggle to ride through the sand. After a brief stop in the booming metropolis of Ocotillo*, we headed back the way we came, getting rained on only very briefly. 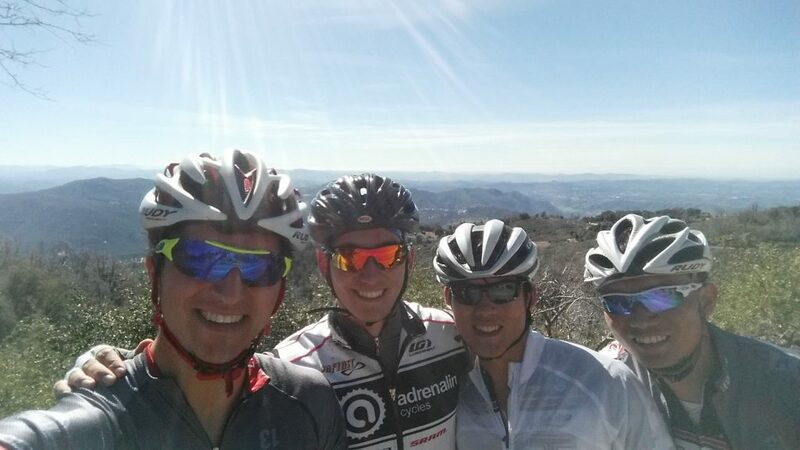 Our final ride in California was a great way to cap off a very challenging and fun week of training. 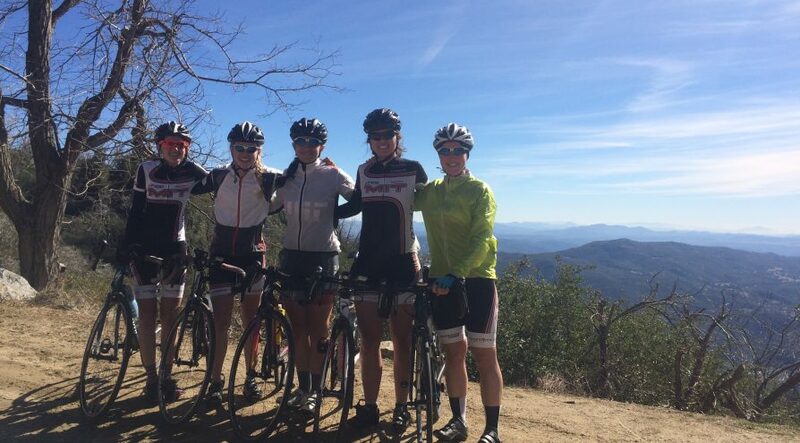 For this year’s winter training camp, the team headed to Santa Ysabel, CA for 8 days of fabulous riding! This post has accounts and pictures from days 1-4 and the next post will cover days 5-8. Remembering how to assemble our bikes upon arrival. 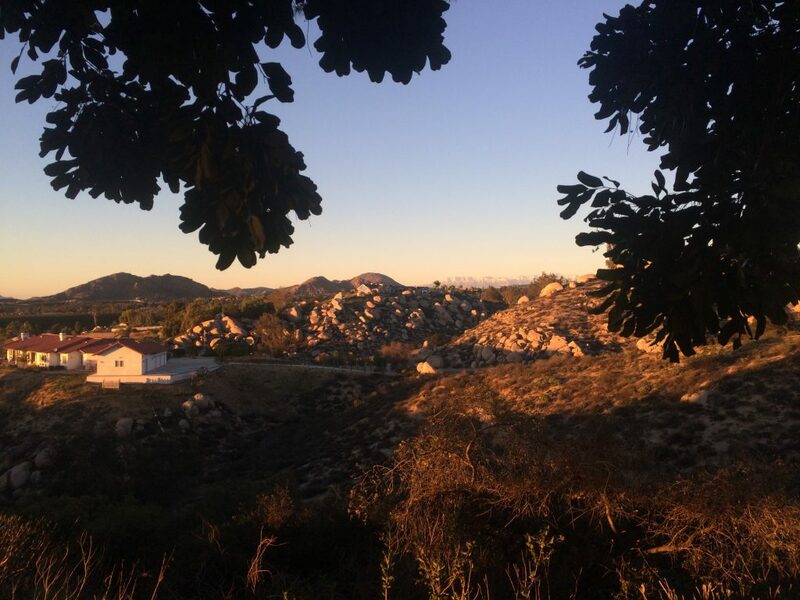 “It was still dark outside when I woke up the first morning in Santa Ysabel. This was my first WTC with the team, and today would be the first day of riding. The last couple of days I had been feeling a bit nervous. I knew I would be doing more riding in the next week than I had ever come close to doing in such a short space of time before, and my main hope going into training camp was just to last until the end of the week. But as the sun came up that morning, any lingering apprehension immediately gave way to excitement. After months of being stuck inside on the trainer, I’d finally be riding outside again. And with the forecast that day calling for temperatures in the 70s, I had none of the layering-related anxieties that are normally a fixture of my winter riding routine. All I would need were bib shorts and a short sleeve jersey, and I’d be ready to go. Since nearly everyone’s sleep schedules were still stuck on East Coast time, we had no problem getting ready to roll out at 8 in the morning. The weather that morning was perfect, with hardly a cloud in the sky, and the first 35 miles of the ride flew by. We put in several intense efforts on the intermittent flats and hills, but we were mostly helped along by gravity on the first part of the ride, descending 3,500 ft over those first 35 miles and averaging 23 mph. When we stopped at mile 35, it was hard to believe we were already more than halfway through the ride. Realizing that I had not eaten yet, I went to work on the food that I had stuffed into my jersey pockets before leaving the house that morning. 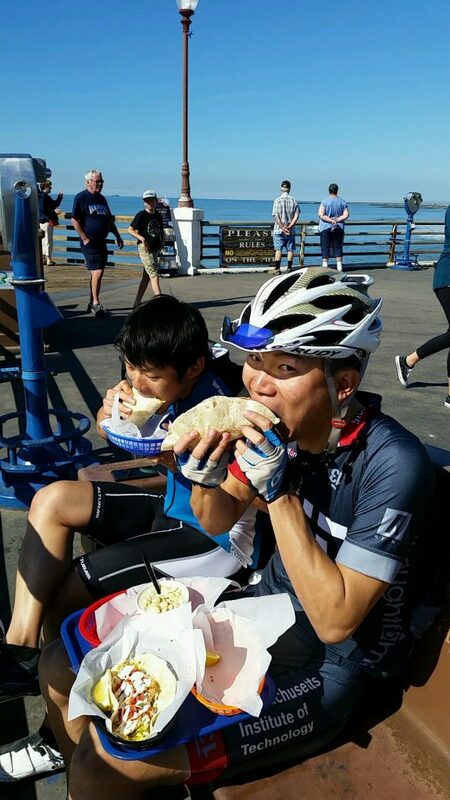 Unfortunately I made the mistake of eating based on the mileage we had ridden rather than on my actual level of exertion, and since coasting downhill doesn’t burn many calories, I ended up overeating by quite a bit. I’d later regret it. I knew we were being helped along by gravity on the first part of our loop, but I didn’t realize at the time that we were also being pushed on by a very generous tailwind. As we reached the outermost point of our loop and turned back toward Santa Ysabel, the tailwind that I failed to notice earlier turned into a nasty headwind, and the challenge of climbing 3,500 ft back to the house, which I was previously looking forward to, suddenly became a daunting task. Miles and Liam cruising along one of the long downhill stretches. The ride back to the house that day was the most difficult stretch of riding I’ve ever done on a bike. My most vivid memories from the ride back are struggling for the longest time to reach 6 mph up a 5% gradient due to the wind, feeling nauseous the whole way after having eaten way too much food at our mile 35 stop, and suffering a sudden leg cramp so severe that I had to get off the bike and stretch before I could even clip my right leg back into my bike, let alone pedal with the leg. The group had also split up in the second half of the ride, so I was riding on my own for most of that time. With about 10 miles to go I saw that Amy had stopped on the side of the road, and I pulled over too. Sarah joined us a short while later, and having gotten some much-needed rest and having found some much-needed company, the three of us rode the final 10 miles back to the house together. 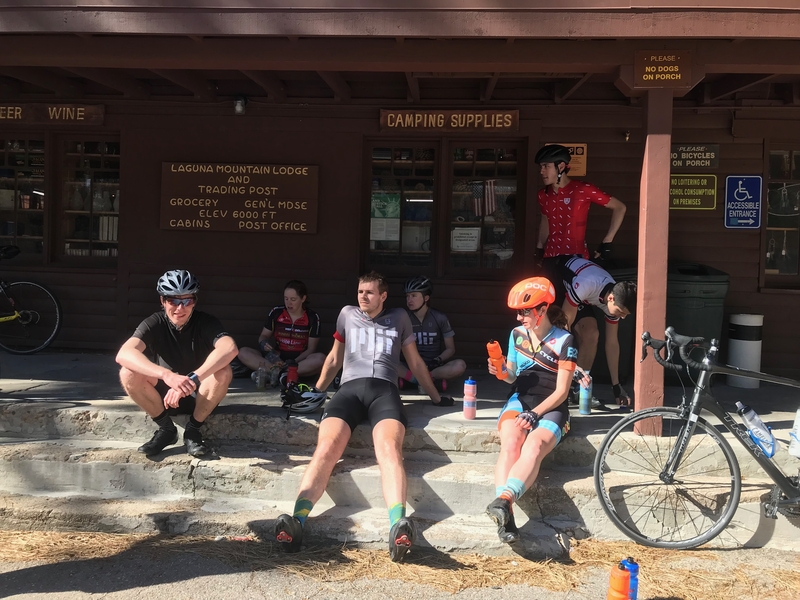 “After remembering how to corner and descend on Day 1 of WTC, we hit the hills hard on Day 2 with 82 miles and 8,400 feet of climbing. The route took us over two lengthy climbs: Engineers Road and Kitchen Creek Road. 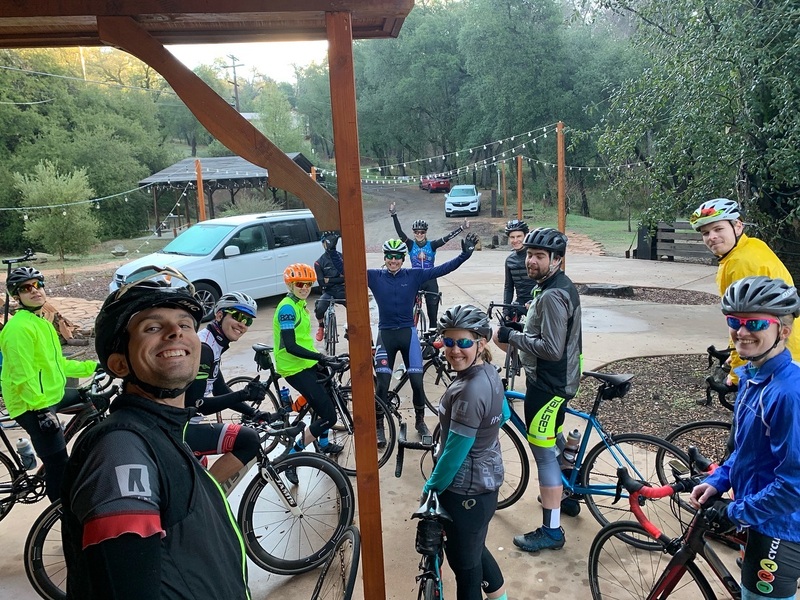 We all clipped in with ambitious goals for Kitchen Creek, our first HC of training camp, and it seemed like everyone was planning to take it easy until mile 45 of the ride when we would hit the base of the 11 mile Kitchen Creek climb. Those plans were shattered once we turned onto Pine Hills Rd in Julian, into a beautiful sweeping descent shaded by beautiful trees and vistas into the canyon below. Once we hit Engineers Road, Tori and I (along with most of the team, it seemed) decided to push the pace up the 25 minute climb. It felt great to climb in warm weather, on shaded roads, and without traffic but I burned a few too many matches keeping up with Tori. We rolled along into Pine Valley, where everyone scarfed down some calories and I inhaled a few snickers bars to prepare for Kitchen Creek. Amy and Emma making their way up Kitchen Creek (which is car-free!). The initial turn onto Kitchen Creek brought us into direct sunlight and intense heat. Adding insult to injury, we had the slightest tailwind which mimicked having no wind at all for our long slog up the 11 mile climb. 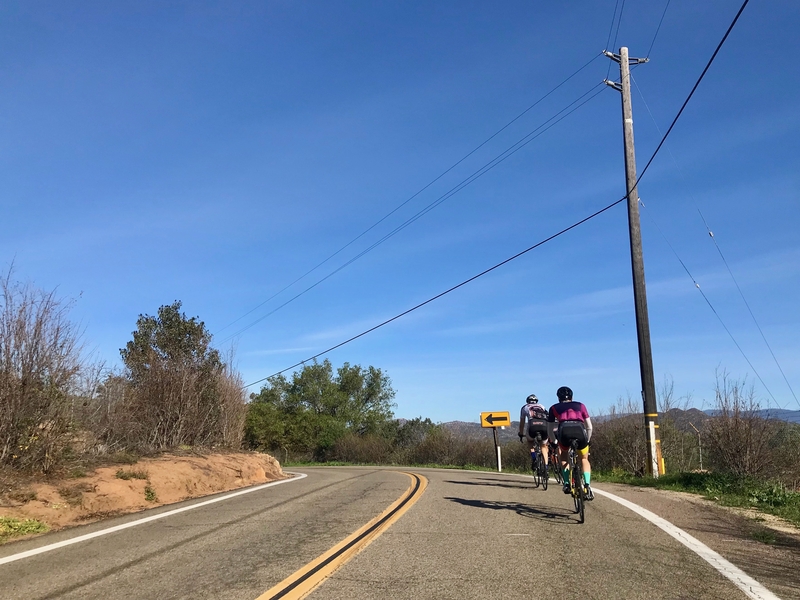 I was determined not to ride all the way to the top of Laguna Mountain alone and hung onto Amy and Emma for the first few miles of the climb, realizing that my typical 60 min of Z2 wasn’t enough of a ’training plan’ to keep up with the MIT women. However, halfway up Kitchen Creek we had to dismount to cross a gate, sending us onto a section of the climb with a gorgeous unmaintained road and tons of turns. This section was amazing and totally brought me back into focus about why I came on training camp, and why I love to ride my bike. The second wind I had here helped me contribute to the team effort of Amy, Emma, and myself snaking our way up the mountain. 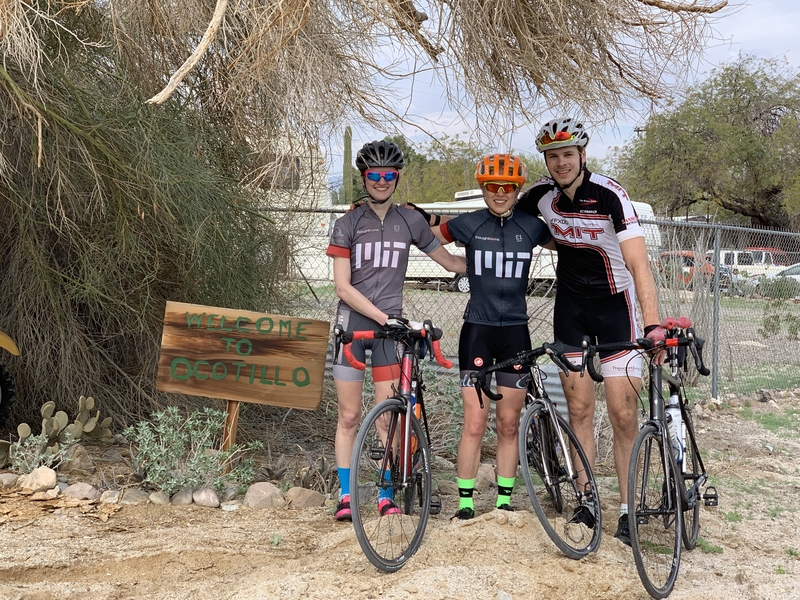 At mile 8, we were met with another gate to lift our bikes up and over, along with Dustin and Liam who took a break to finish the climb with us (yes, MIT cycling has a lot of team camaraderie!). 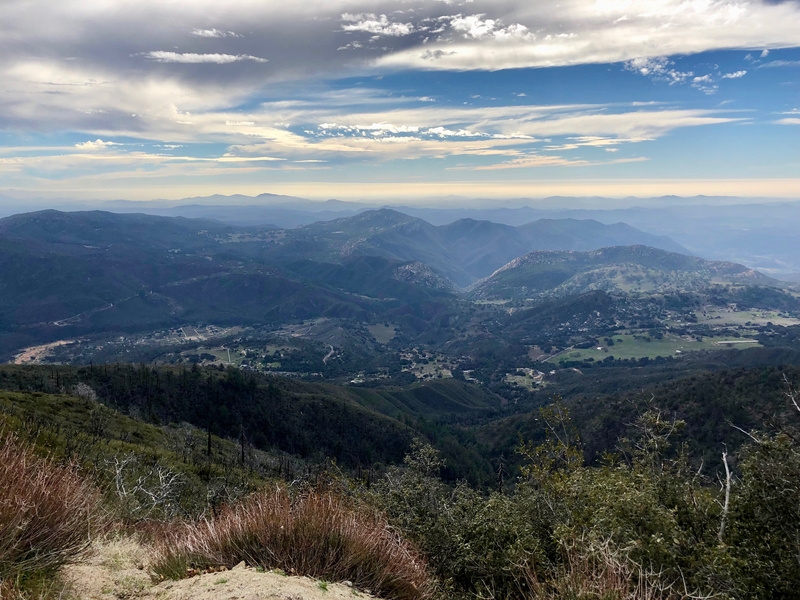 In this final section of the climb we ascended into pine forests and at this point I really perked up about reaching the top of Kitchen Creek and went full speed ahead to the Laguna Mountain Lodge and Store for more snickers bars. Regrouping as a team at the top of Laguna Mountain, everyone looked exhausted and sunburnt from an hour twisting our way up in the midday sun. 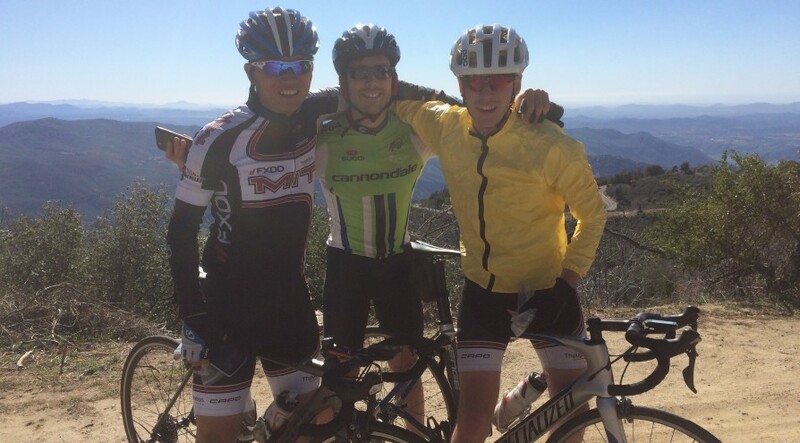 Luckily the final 25 miles of the ride allowed for leisurely descents overlooking the desert to our East. I appreciated all the amazing geology on this section of the ride — taking in all the granite pegmatites and keeping an eye out for some faults in the road cuts — and took a break from using those climbing legs. 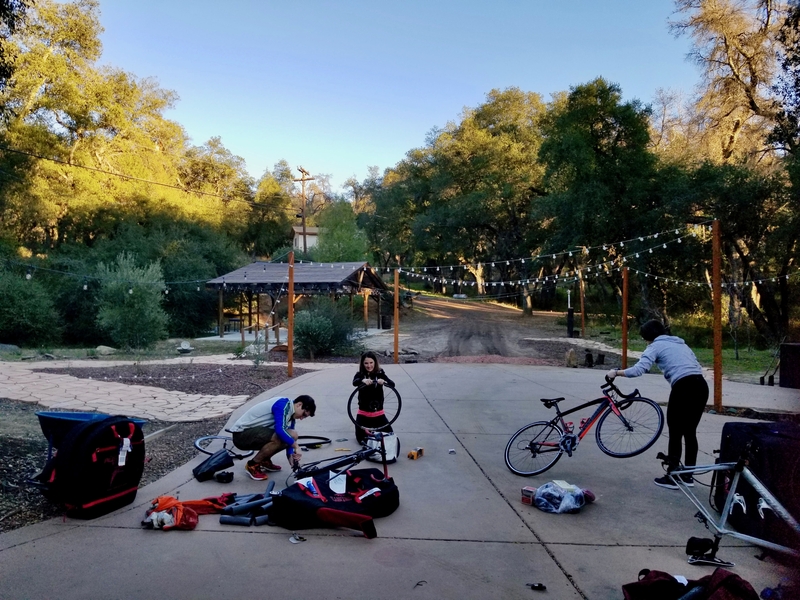 Upon arriving back at the team HQ in Santa Ysabel, I devoured an absolute feast of a snack and agreed with everyone else that it was time for a rest day. A well earned rest stop at the top of Kitchen Creek, the highest point on our trip at 6000ft. and fit in plenty of stretching! 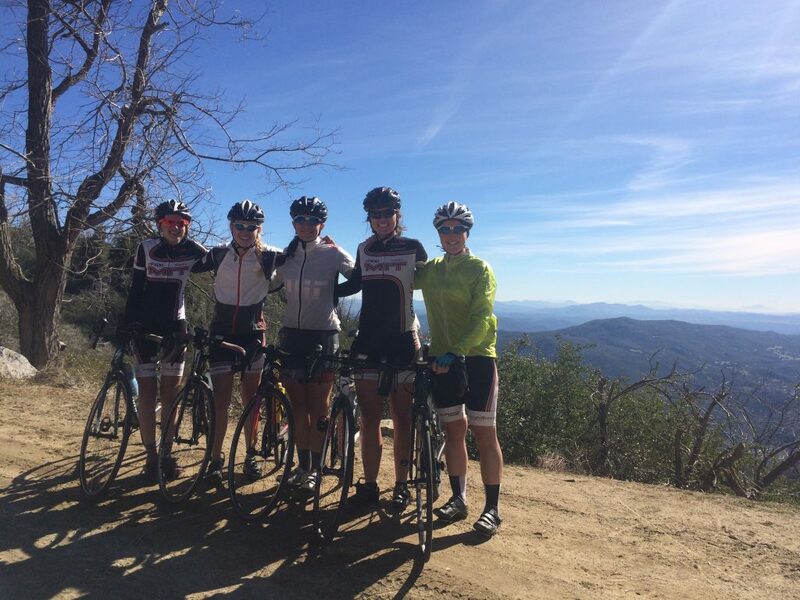 Our hard work paid off, as we were rewarded with spectacular views at the top of Palomar. Looking forward to the way down! Stay tuned for days 5-8! 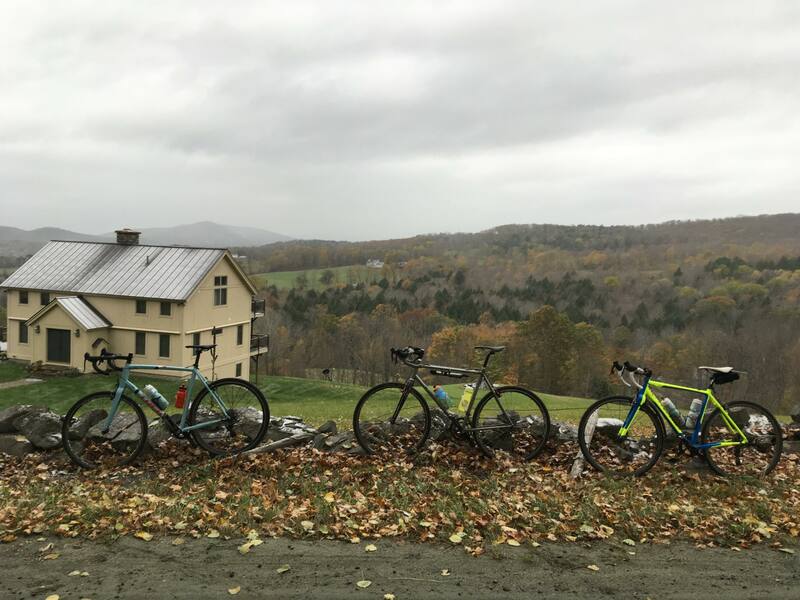 On day 2 of fall training camp, we hoped that the snow would’ve melted so that we could ride around Killington, but it was not meant to be. In fact, the driveway was so slippery that we had to bust out the shovels to get the cars out of the driveway! Instead, we decided to drive to Mount Wachusett, where the riding weather was meant to be better. 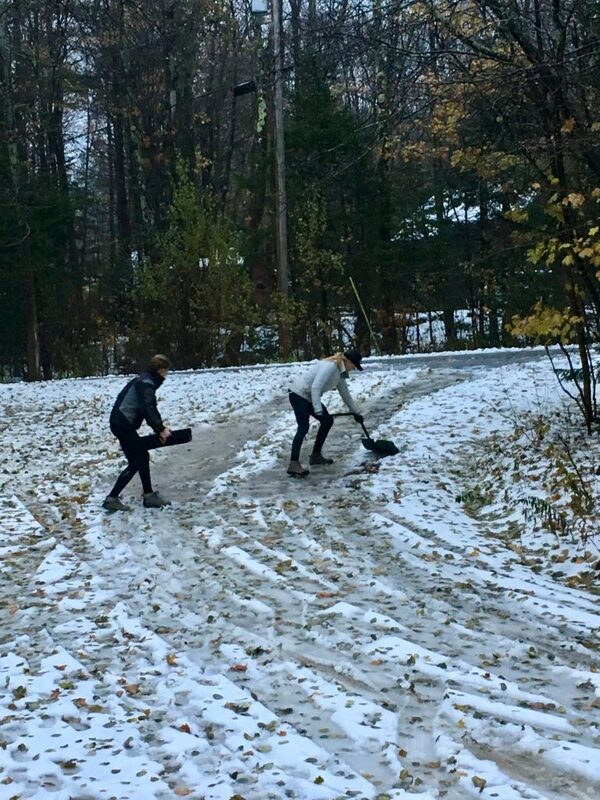 Thanks Amy and Tori for shoveling! 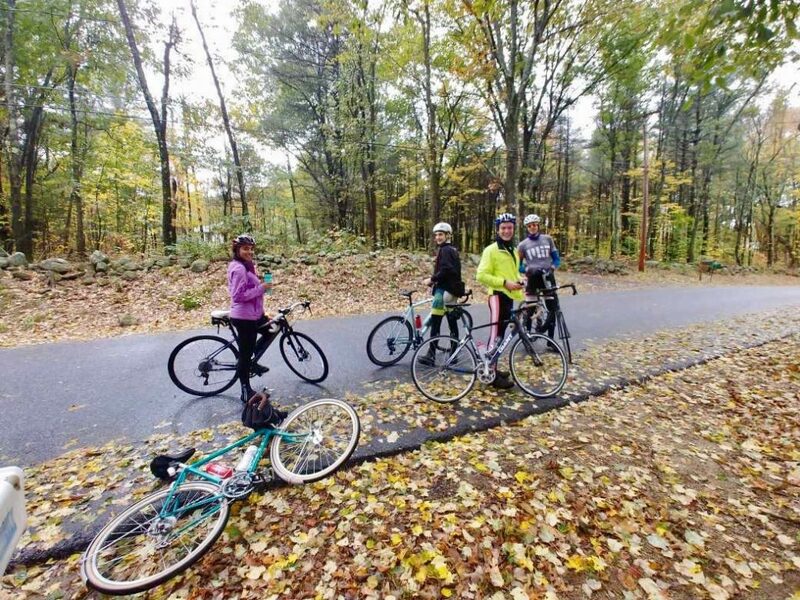 Although it was still wet and pretty chilly, Wachusett was snow free and everyone was excited to ride outside (especially those who had elected to ride on the trainers the day before). Bundling up before heading out. 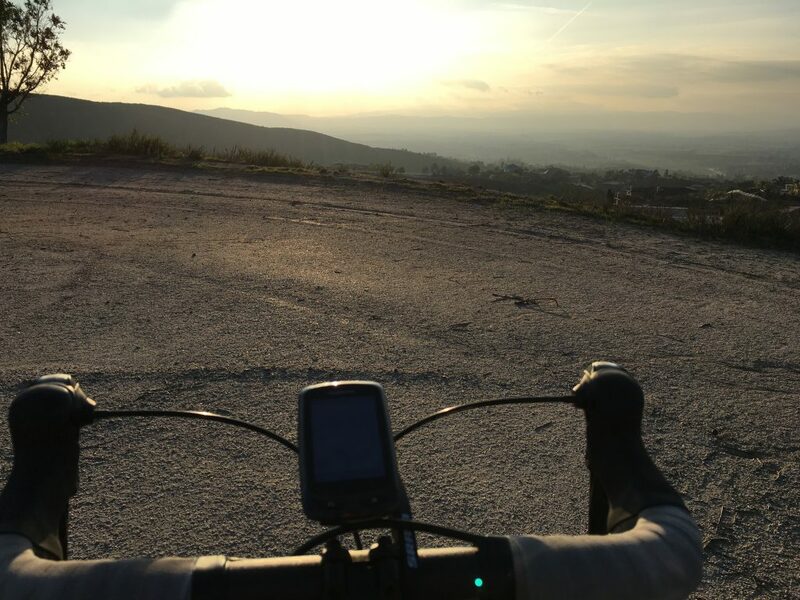 Here are Carolyn and Nic’s accounts of Sunday’s ride. “The biggest takeaway from FTC weekend is that Mother Nature is no match for the logistical prowess of Amy and Miles. Wintery mix was still coming down on Sunday morning, but Miles had personally guaranteed nice riding on Sunday. Luckily the road captains had a plan B up their sleeves, so we piled into the cars and drove two hours south to western Mass. The new plan was to ride up Mt Wachusett, and then continue on through the rolling hills of western Mass. My original thought was to ride the longer route (75 miles) but after being dropped by the speedy group just five miles in, I started to reevaluate. Irene and I ground our way up Wachusett solo. At the top, I ate an entire bag of sour peach gummies and felt immediately both better and worse. We were happy to see the medium group summit a few minutes later. I ate half a pop tart for good measure (thanks Jon!). 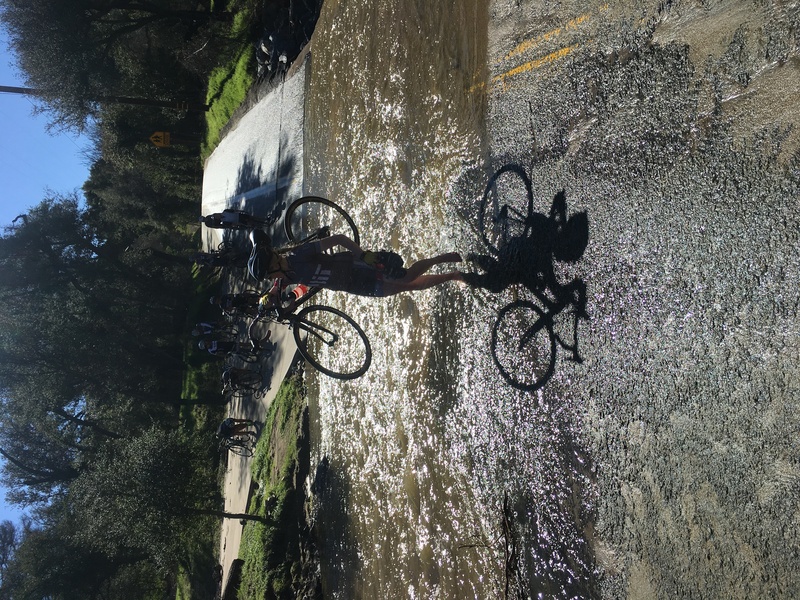 “As Google Maps swallowed my last crumb of data to announce the final mile of Sunday’s ride, I was struggling. Not for fitness, though there had been plenty of that when Jon wasn’t so charitably positioned into the wind ahead. Rather, I was struggling to control a brewing irritation; irritation with the road grit periodically thrown up in my eyes, irritation with the insurgency a chugged Coke was starting in my stomach and, most of all, irritation with the cheerily mechanical voice announcing I still had a mile left of all of it. I’m sure the voice meant well. To be fair, it could hardly have known that so far during the weekend I’d enjoyed 1 ejection out of both Saturday’s pace line and my fitness fantasies, 2 surprise appointments with the tarmac and a combined 4 hours of sleep. And yet despite my drops, crashes and insomnia, and despite my growing unease (Coke-related and otherwise), writing now a week later I can confirm it wasn’t just dehydration talking when I concluded, fully swathed on Sunday night, that FTC 2018 was the single most enjoyable weekend of my time at MIT. 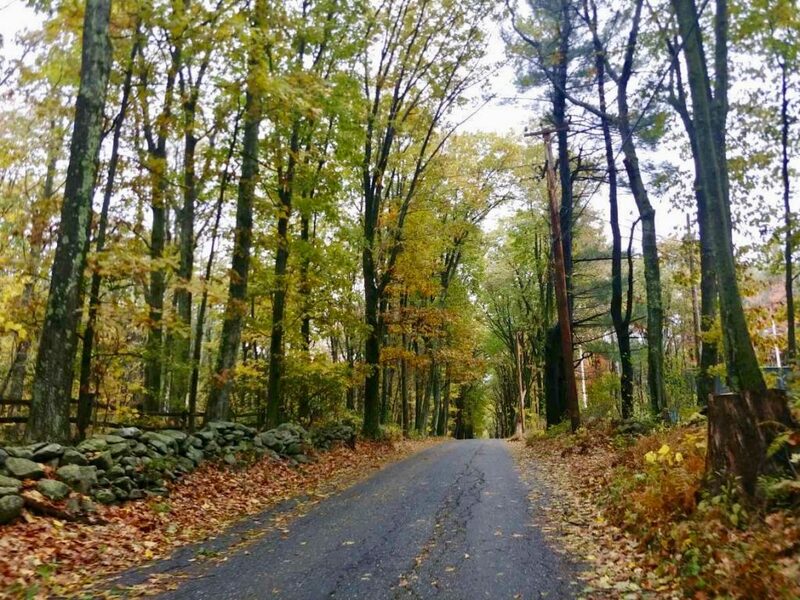 Quiet roads and fall colors! 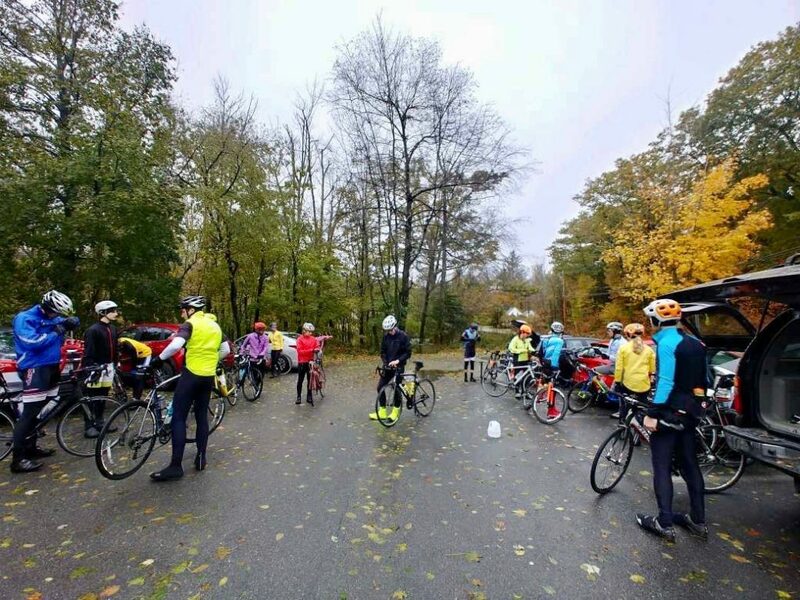 Despite the sub-optimal weather, everyone had a fun weekend of riding and bonding together and it was great to see so many new riders come out for the weekend! 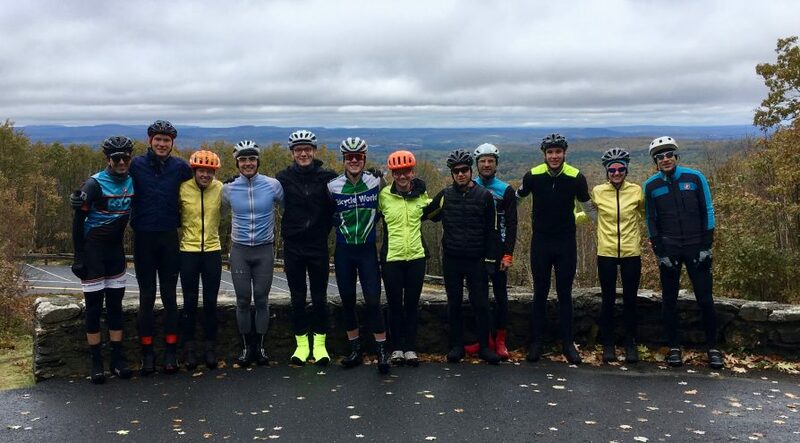 This year for fall training camp, we headed to Killington, Vermont. Miles and I had planned some challenging routes, including climbing up Mt. Ascutney and to the top of the Okemo Ski Resort! Unfortunately, snowy conditions presented a different set of challenges. On Saturday, instead of riding the planned routes, we split into three groups. 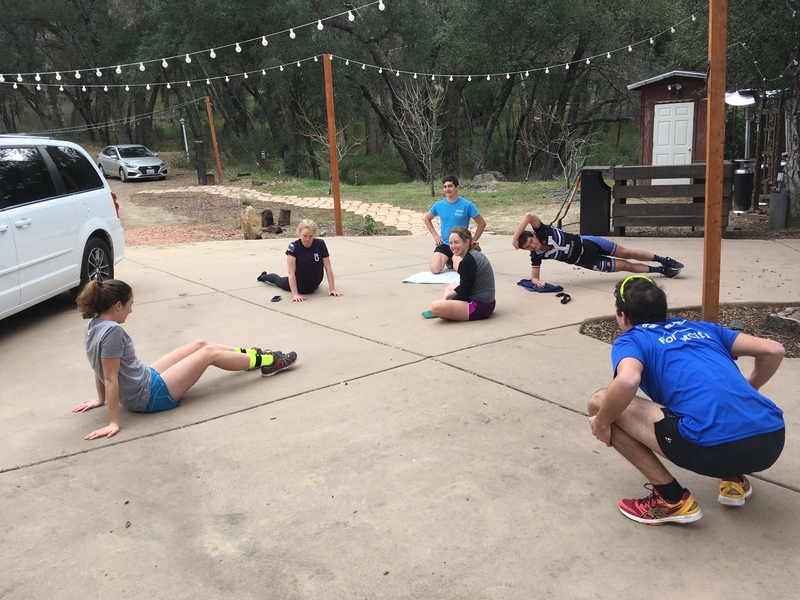 One group stayed at the house and used the outdoor porch to get in some quality trainer workouts. 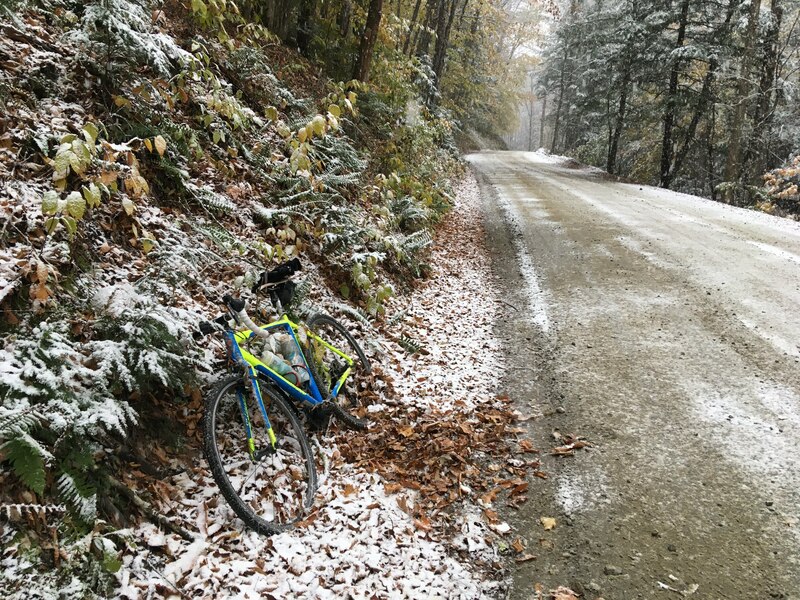 A second group headed for lower ground, hoping to escape the worst of the weather, while a third embraced the snow, tackling Vermont Overland, one of the hardest gravel rides in Vermont! 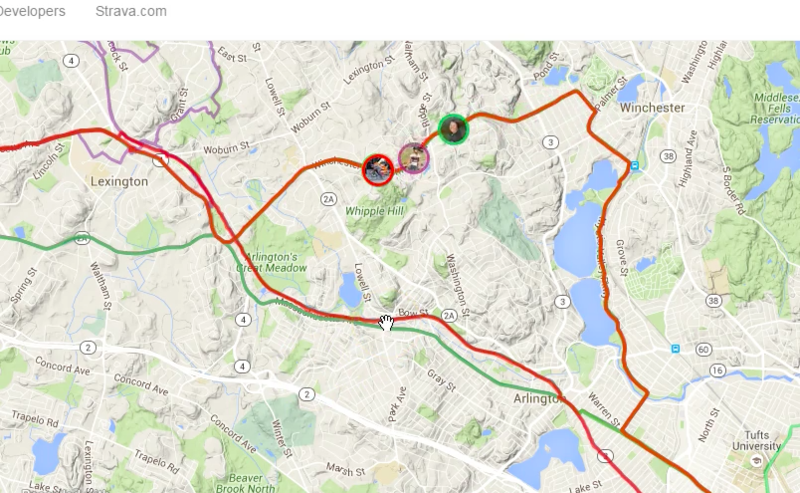 Here are Jeremy and Pat’s accounts from their Saturday rides. “I was really excited for fall training camp. Zipping along winding country roads in rural Vermont past old farmhouses and rolling hills of autumn foliage on a crisp and clear morning? Nothing better. Then the Nor’easter came. 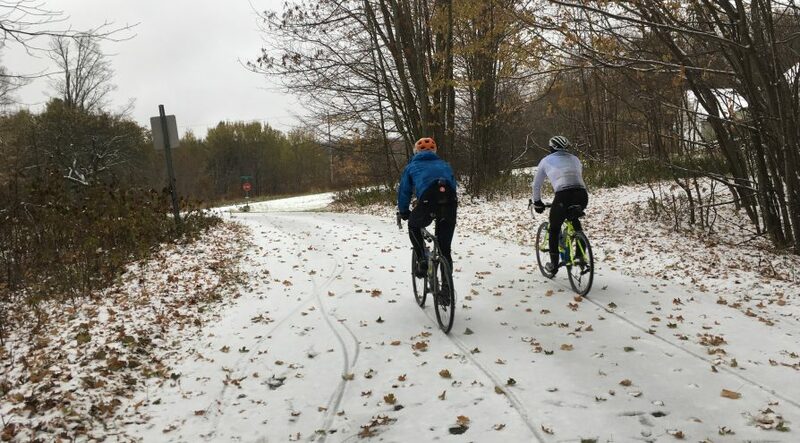 Turns out Killington, a ski resort, is not the best place for road cycling when the first winter storm of the season rolls through. Everyone was frantically scanning the forecast in the days leading up to the weekend, but once every weather site stubbornly refused to budge away from 3-5 inches of mixed snow and freezing rain on Saturday, our road captains, Amy and Miles knew an alternate plan was needed. 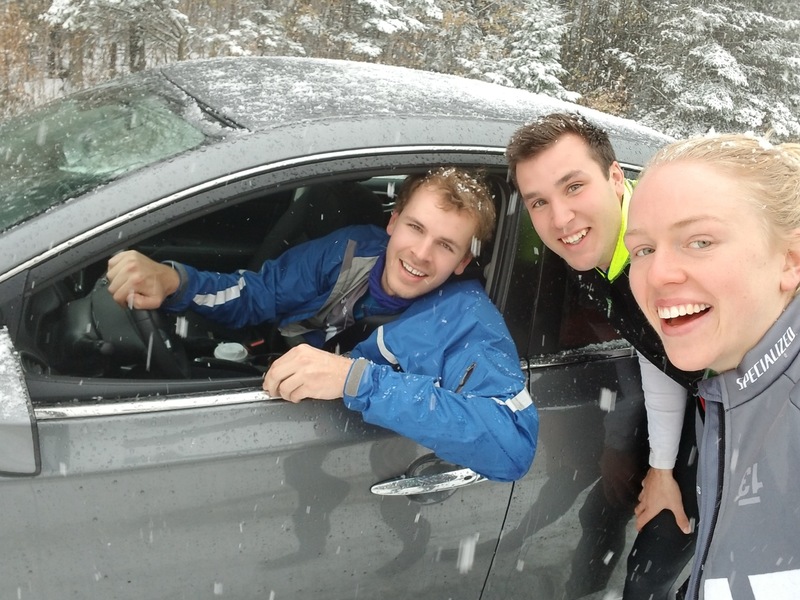 Their solution was to drive before dawn to a lower elevation where the temperature would still be near-freezing, but at least it would be raining and not snowing. Determined to make the most of the trip, we found ourselves bundled up for a near-arctic adventure at just past 7am in the parking lot of the Price Chopper outlet grocery in West Rutland, Vermont. The weather, at least initially, proved more cooperative than expected. After a no-warmup, no-nonsense climb to start the ride we found ourselves hurriedly removing layers. I had an awesome time pushing an aggressive pace with Miles, Tori, and Jon, even as the wind picked up and the clouds grew darker. I couldn’t help but thinking that those who opted to stay behind for a day on the trainer had definitely made the wrong choice. 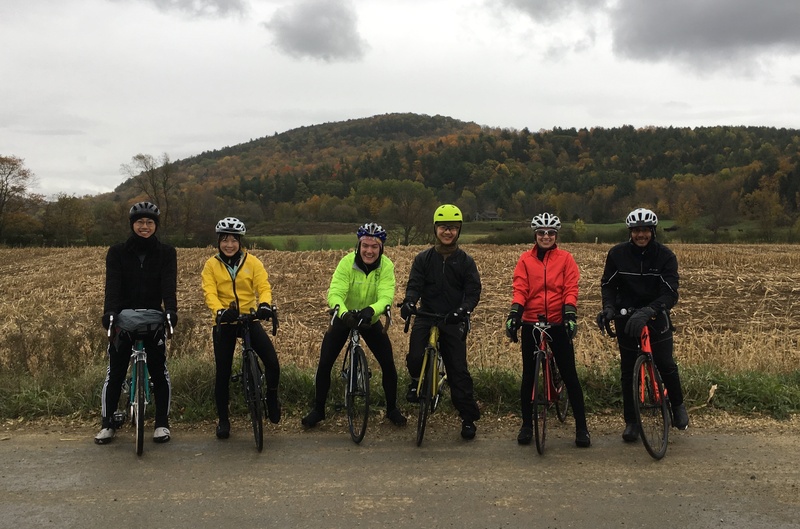 After a 40 mile loop (complete with requisite bucolic Vermont countryside vistas), three of us decided to push our luck for another short time trial loop. That’s when the weather truly turned nasty and we returned to the car an hour later, thoroughly cold, wet, and definitely done for the day. Enjoying the Vermont scenery before the precipitation begins in earnest. Happy to have made it up the hill! “It all started with a friendly enough e-mail from Berk a week out from Fall Training Camp: “Vermont is famous for dirt. Yes, you heard right. Not craft beer, not maple syrup, and not skiing or outdoorsy things. Dirt.” Then something about tires, vertical feet, and shoes you can walk in. But for Berk’s two takers, he had us at “dirt”. As the team arrived in Killington (along with the tail-end of hurricane Wilma), the talk was all about weather. Amy and Miles were huddled around 2 laptops and 5 different weather sites trying to find roads below the snow line. But, for Berk, Daniel, and Pat, we wanted to be in the snow and on the gravel. Who would choose pavement and 35 degree rain over Vermont gravel and snow. Plus we got to sleep in an extra hour, who cares about beating the storm? Bring it on. Morning arrived, with at least one of us too excited to have slept all that well. It was perfect outside. We crammed down some calories and drove to the start of the Vermont Overland course. The drive was beautiful, classic Vermont. And just a few snow flurries. We turned onto our first gravel road, drove a few miles and debated where to park. We opted not to park in a pasture, deciding even the small chance of getting towed was too high. We found a spot out of the way on the shoulder, threw hand-warmers in our gloves and we were off. The first two hours were quintessential Vermont gravel riding. Steep climbs. Rolling, swooping descents. Cows grazing and horses running in their pastures. Farm houses overlooking valleys that still held some golden colors. All of this maybe giving us energy to ride maybe harder than we should. And we were treated to what they call Vermont pave, with sections with names from the Tour of Flanders. The turn up the Vermont Koppenberg was one you’d never notice if you weren’t looking for it. It was barely an abandoned road, and covered in inches of loose leaves. Up we went on sections like this, again and again. And loving it. Some of these ATV roads seemed mostly used to keep the networks of maple taps up and running. Somewhere around hour three, the weather turned. The friendly flurries changed to excruciating ice pellets. And from then on, the weather alternated between sleet, snow, rain, and ice – often all four at once. Oh, that is why the other group got up so early. Now the roads were covered in an inch of slush. We let air out of our tires for grip, but our pace slowed to a crawl. Our shoes slowly filled with water, we hammered climbs to warm up. By hour four, we were all cratering. We were dreading the pave sections with their round stones covered in wet leaves and snow. There were crashes. Brand new brake pads worn completely from the wet grit and steep descents. Berk grabbed his levers so hard that his cables pulled out of his canti-brake straddles – front AND rear. Amazingly, spirits stayed high the entire ride, even as the misery and crashed energy levels piled on. Even when, at mile 40, our GPS told us to go straight but the sign said “Dead End 0.8 miles”. It was a great day of riding that I don’t think any of us will forget. The joy and beauty of those early miles, the suffering of the later miles, and the joy of reaching the end. Something all riders can relate to. 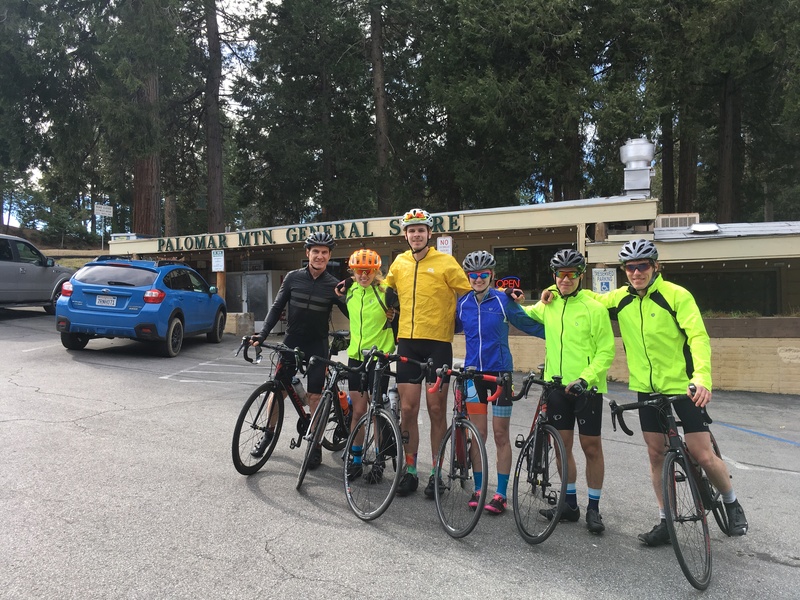 Day 5 we tackled Palomar (for the first time)! Palomar is an HC (hors categorie) climb, the toughest category of climb out there. It is 11.6 miles at 7%, about 4200 ft of elevation gain. It was the biggest climb many of us had done yet (including me!) so we had to make sure to pace ourselves. The climb itself took me 82 minutes, so I was so glad to have a Stages power meter to help pace me! We regrouped at the top and took a break, drinking cokes and replenishing salt and electrolytes we lost on the long climb. The road we went up and down! Later that night, Quinn White crafted a cycling-related trivia for us to play! The categories were “General Cycling Knowledge,” “History,” “Current events,” and “Quotes,” with ~10 questions in each category. We split up into the teams we were going to be in the following day for mock races to get pumped up and have some team bonding. Charles Wu of team “Katy’s Angels” was the clear MVP, but the game spiced up when he got a phone call in round 3 and the other teams—“The Lord of the Chain Rings” and “No Quinn, No Win”—tried to claw back. In the end it was in vain and Katy’s Angels won in a landslide victory. For the third race our team had a plan: I would attack, Youyang Zhao would bridge and pull me for as hard as I could go. If another team caught us, we would have Tori Wuthrich fresh in the pack, shielded by Constantine Weisser and Quinn White, to sprint for the line. Youyang and I talked before the race about what power he should put out to pull me so that I would be going all-out for a couple minutes but not get dropped. It went pretty perfectly for Youyang and me, and Tori had a great lead out and sprinted from the pack for second! 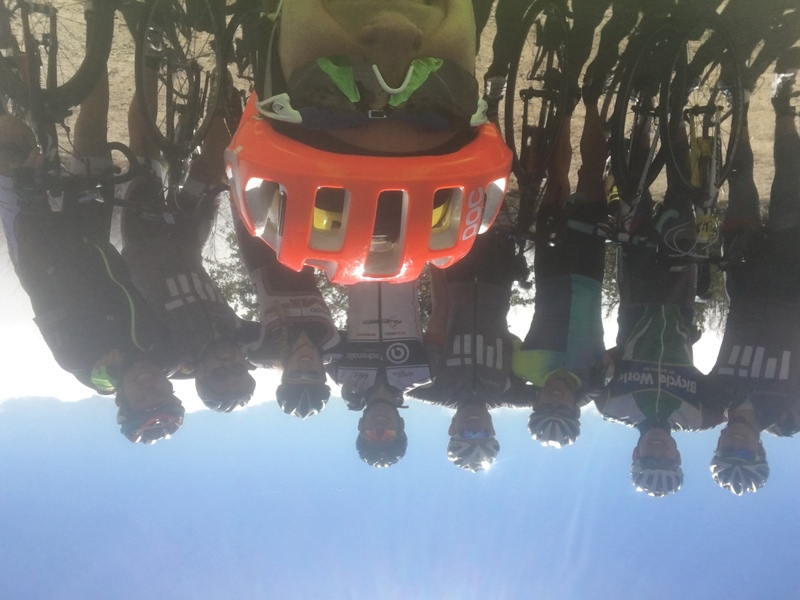 We were above the clouds climbing up Palomar the last day! And then it was back to the house to pack our bikes :(. We are all home safe and sound, and after a few rest days were ready to get back on the saddle! Of course, then a snow storm hit Boston and we haven’t been able to go outside, but it gives us motivation for our racing season which is rapidly approaching! Tori crossing the river that formed due to rain in the area before we got there. Great shouldering! So we were all really enjoying the ride until we realized that we were in the middle of nowhere, so there were no stores or gas stations anywhere around for water. We met a very friendly woman who let us use her hose to fill up our water bottles so that we could all make it home! Thank goodness for the kindness of strangers. 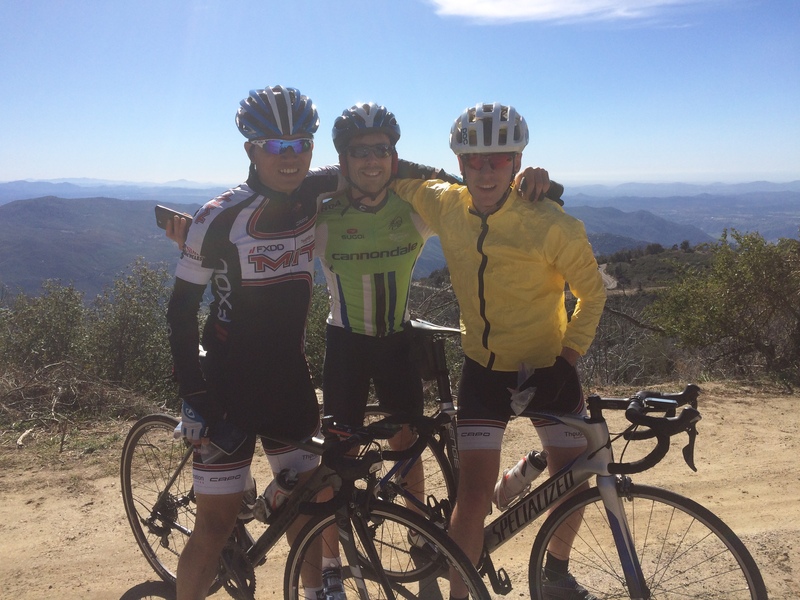 Day 2 was 73 miles, but this time “only” 5000ft of climbing. We went down south around Lilac for more stunning scenery with really beautiful descents and scenic flower farms. Tomorrow we’ll go through the rest of the trip (Days 5-8) and wrap it up. 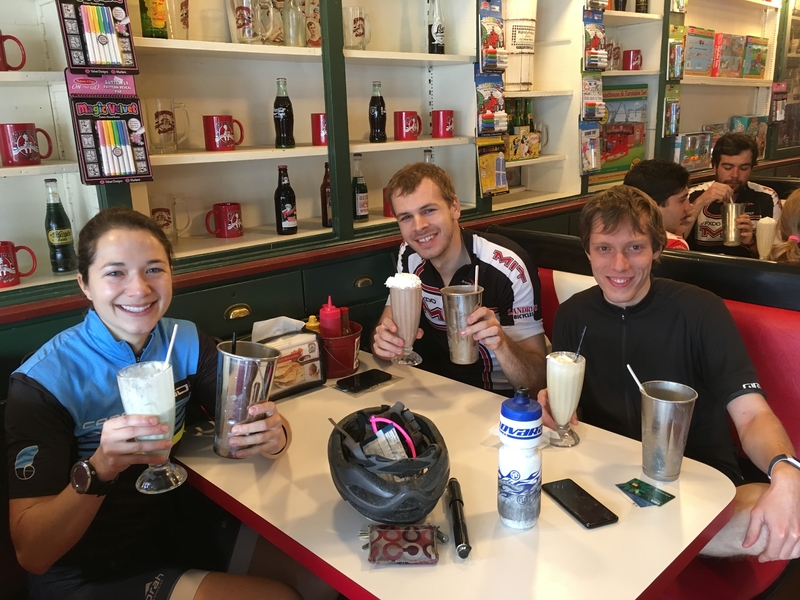 Written by Emma Edwards (women’s road captain), with help from other training camp attendees. Stay tuned for more recaps in the next couple days! 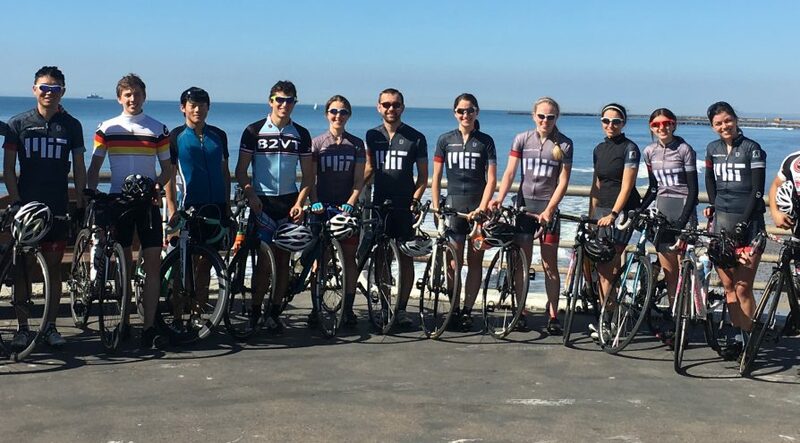 “I’m a first year masters student so this was my first time attending training camp and was also my introduction to most of the team outside of a couple club rides that I joined in the fall. 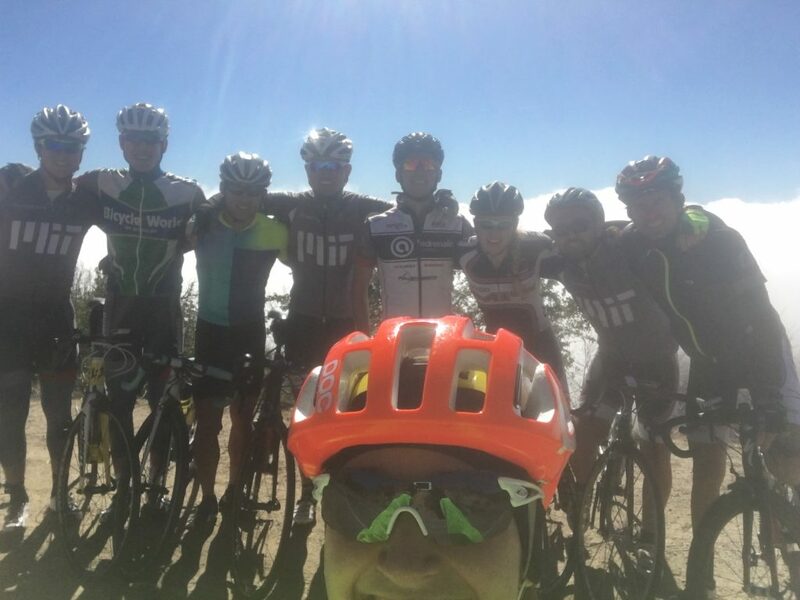 I came on the trip not knowing most of the group but was excited to meet my teammates while getting in some good ol’ fashioned miles on two wheels. 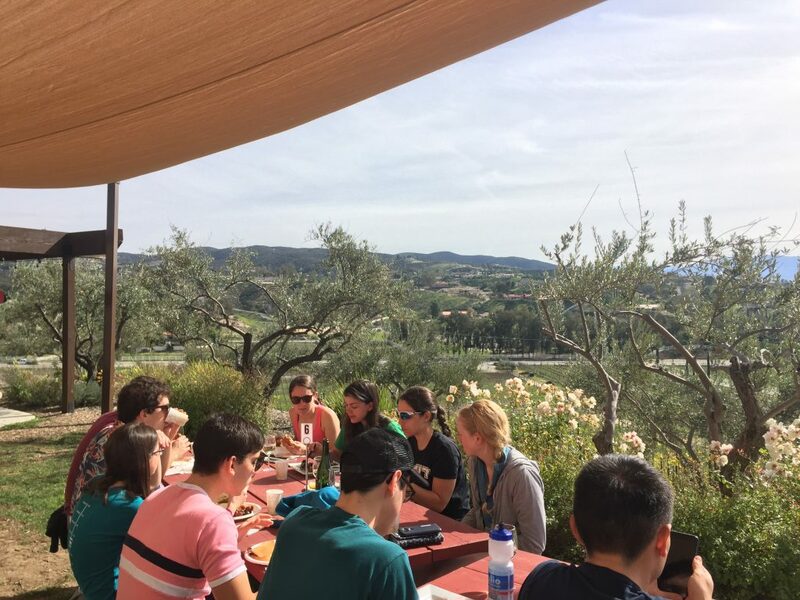 The week definitely didn’t disappoint and I can confirm that the case of FOMO you feel yourself coming down with might be worse after reading this blog. The week had plenty of volume and coming out from Boston made the hours outside on the bike that much sweeter. Day 1 brought more climbing per mile than I think I’ve ever done and unfortunately my back paid for it and forced me to take time off the bike on day 2. Of course, starting a week-long training trip with injury made me pretty nervous but luckily I was able to build my way back through my day off and the following rest day. And for the rest of the week, the team kept checking in on me which speaks to the camaraderie the group had during the trip. 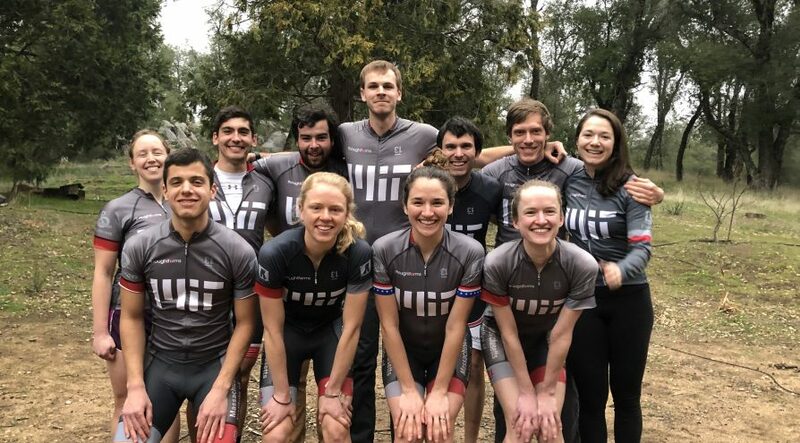 We also had the pleasure of adding a few alumni to the group and it was great to hear about everything they’ve been doing both on and off their bikes in their time since leaving MIT. We were particularly excited about our 3 alumni who could join us: Jen Wilson, Stan Prutz, and Chase Lambert. Jen and Stan were among the 7 who had been to training camp before, so it was great having them there for their experience and advice. Stan made the team very happy when he made chocolate-chip blueberry portables. Jen, along with Anne Raymond, were part of the silver-medal winning women’s TTT team last year at nationals, so her advice on TTT-ing was particularly useful! Since so much happened in training camp, I’m breaking this up into a couple different blog posts: Days 1-4 and Days 5-8. 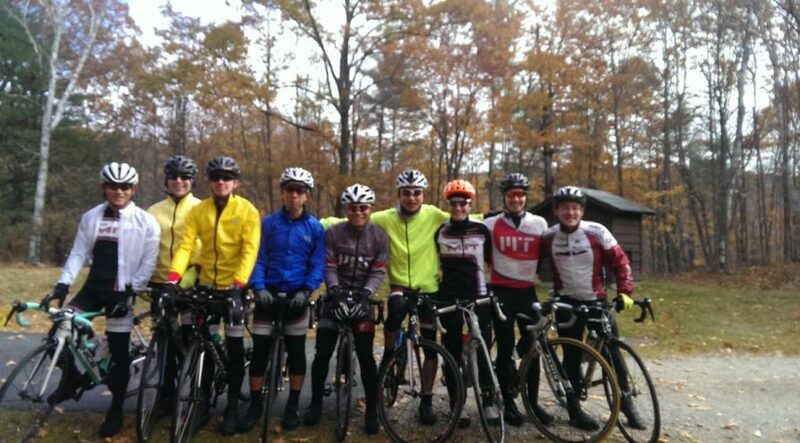 Last weekend I joined the MIT Cycling Club for the fall training camp near Lake Sunapee, New Hampshire. 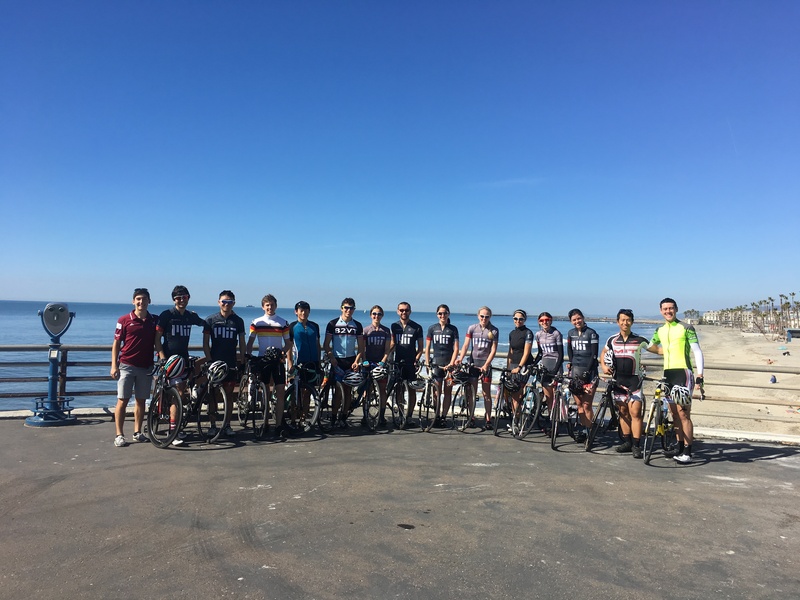 Some see this weekend as the start of training for the spring road racing season, but since I am not a student and won’t be doing much collegiate racing, I saw it more as a coda to the extended “summer” of road biking that I had been enjoying, and was also hoping to push myself a bit. It was around freezing when we started out each day. I’m more often too warm than too cold and my general philosophy for bike clothing is “dress for the weather you want” and hope that I work hard enough to keep myself warm. A ride a few weeks ago with Berk and Liam made me realize that this was unsustainable and I went out and bought some stuff to protect myself from the cold without being too flappy. The rides were cold at first but not unbearably so, getting a little warm towards the end of the day. On the first day I had the choice of the long, medium, and short rides, or some kind of crazy backroads adventure ride that didn’t really seem like my thing. I wasn’t sure if I wanted to do medium or long, but they started on the same path so I set out with the group and resolved to choose the route when I had to. We set off towards Mt Kearsarge and the fastest few rides quickly took off ahead of us. The first part of the involved a rolling but generally upward freshly paved road for five miles towards the base of Mt Kearsarge. At this point we started to spread out, with PK and Wade getting ahead of me but remaining within eyeshot, while Liam and I passed each other a few times. I hadn’t done too much research besides glancing at the map and knowing there was a big hill, and I took it at a fairly high but sustainable effort, and then got to the gate of the mountain, at which point the slope roughly doubled, the road quality halved, and there was a sign saying it was four miles to the top. I cranked down to the lowest gear and started grinding up, as my speed fell to about 6 miles an hour (it was at this time that I decided I’d prefer the medium ride). After half an hour of alternating sitting and standing grinding, I made it to the top, which fortunately was half a mile before I was expecting it. I got a photo at the top and started to head down before I got too cold. The road was covered in leaves and cracks and was full of sharp turns, so I basically held my brakes the entire way down and hoped it would all be ok. It was. At the bottom the faster riders were about to head off and I was still recombobulating myself so I waited for everyone else to reach descend. When gravity was finished, our group consisted of Kolie, Lucy, Amy, Liam, Anne, Stan, and myself. 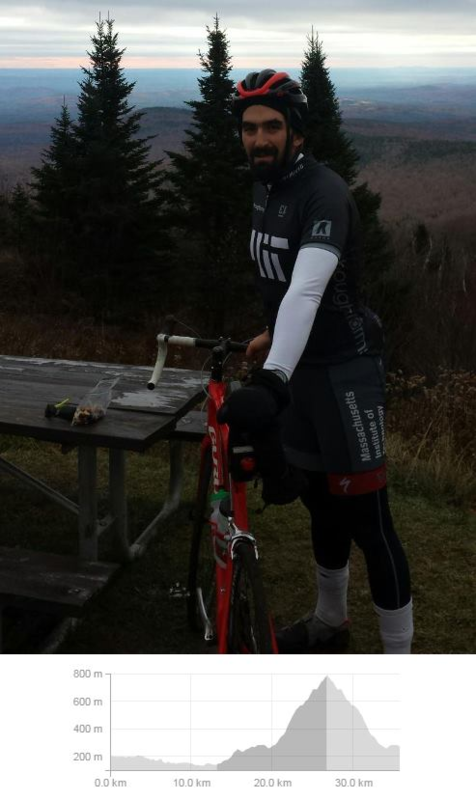 The rest of the ride consisted of a lot of rolling hills, gradually gaining in altitude and circling Lake Sunapee. Eventually we got to cash in all our gravitational potential with a massive descent, at which point Lucy, Stan and I separated from the group and hightailed it home. I think I reached 42 mph on the final descent. bringing the total up to about 64 miles, the second longest ride of I’ve ever done. I felt a lot less dead than after my last ride of comparable length, so that’s an improvement. On the second day, the bulk of the group went on Emma’s PRETTYDECENTRIDEIGUESS which involved climbing the main face of Kearsarge again. I went on the medium ride again, with the same group with the addition of Quinn and Oli and the subtraction of Stan. We started out going up a different face of Kearsarge, which wasn’t quite as much of a slog as the main climb the previous day. We regrouped for a snack at the top and rolled down. The road here was much better quality than the one on the other side, and also straighter, so going down wasn’t quite as terrifying and I let myself build up a bit more speed. The rest of the ride again was a lot of rolling hills and a few segments going in the opposite direction of the previous ride. There was one very large hill in the middle of it that took about 12 minutes to bike up, but annoyingly we stopped to regroup right before the end of the Strava segment so it looks like we did it super slow. This ride was about 50 miles total, and with about five or six left we had a false-alarm flat on Quinn’s bike. Lucy and Oli had gone ahead, and we started rolling again and immediately Kolie’s derailleur catastrophically removed itself from his bike and the world of functioning bike parts. I sprinted ahead to catch Loli and told them what happened. They decided to sprint home so Lucy could come pick up Kolie by car, while I turned back to tell the rest of the group. I climbed back up the hill that they had stopped on top of, to find out that a passing pickup truck had given Kolie a ride. Anne texted Lucy telling her not to get Kolie, and we headed back to the house. Both rides were really nice and my body and bike were mostly functioning adequately. 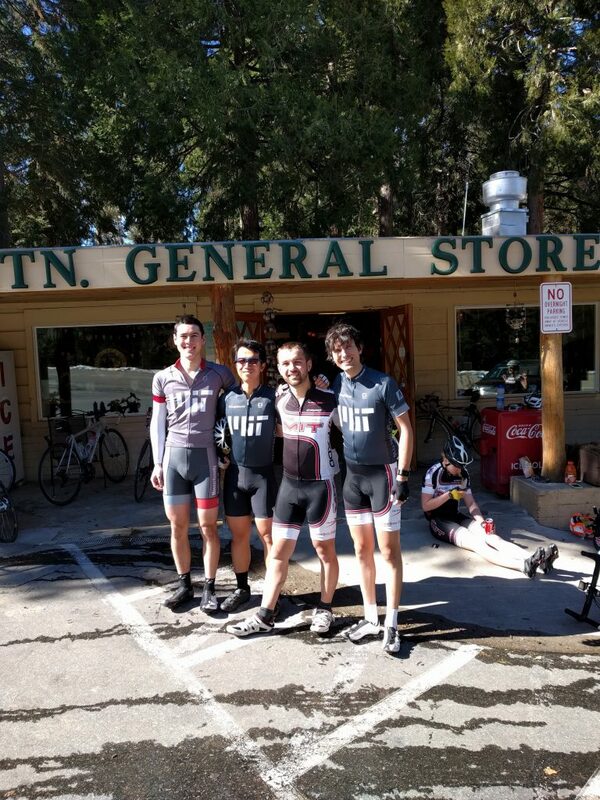 I’m a little regretful that I didn’t try to ride with the faster group, but I’m also glad I didn’t wreck myself going at 100% for six hours or get dropped in the middle of nowhere. All in all it was a really fun weekend and it was a really nice area for biking. I’m currently on a work trip to Singapore and when I get back it’ll be almost December and summer might be over, and this was a great way to end the season. 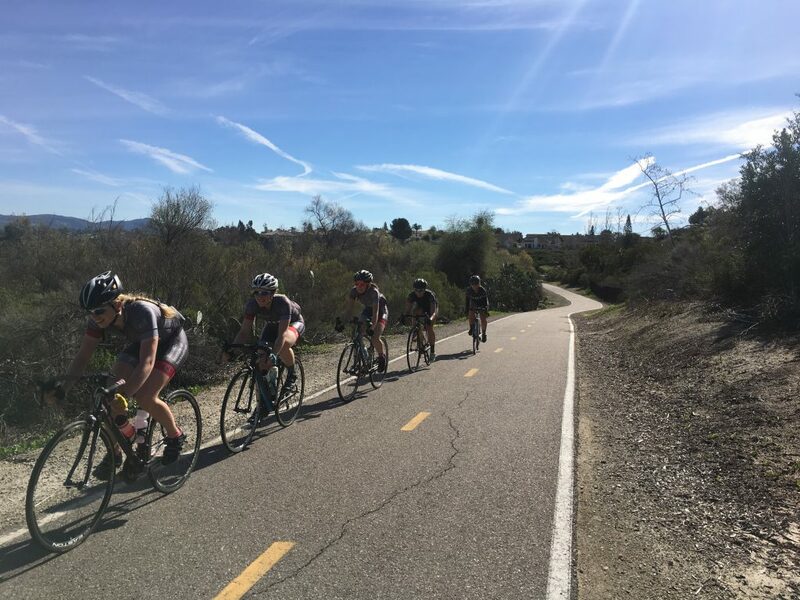 Well-rested from Day 3, team members had two ride options for Day 4: go for an intense climb up Palomar Mountain or take a lighter ride to Oceanside. 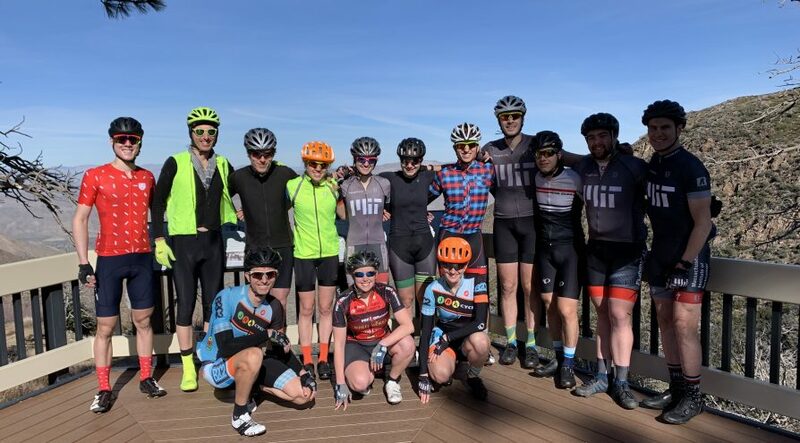 The clear, sunny day with winds around 5 mph allowed the climbing cyclists to enjoy the mountainside vistas, seeing as far as 50 miles away and 5,000 feet below. 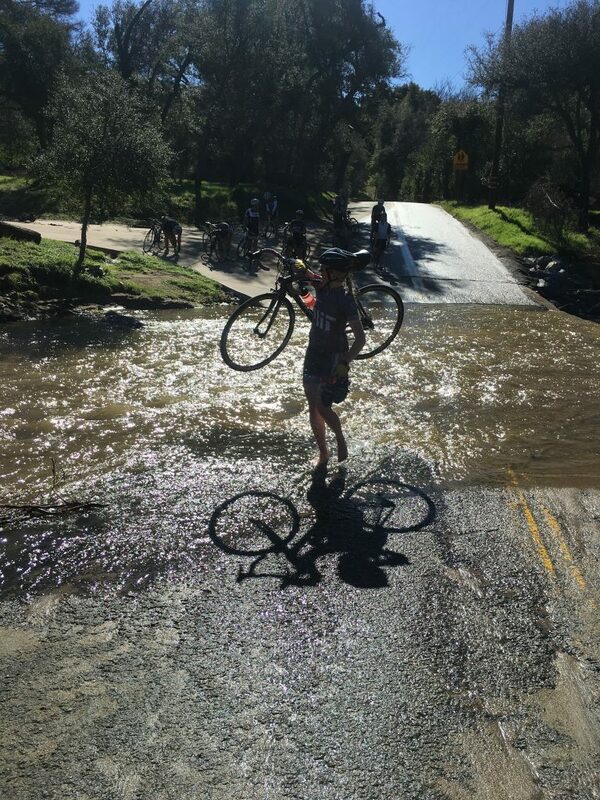 All climbers made it up and down safely, including a Double Palomar by Zack Ulissi. 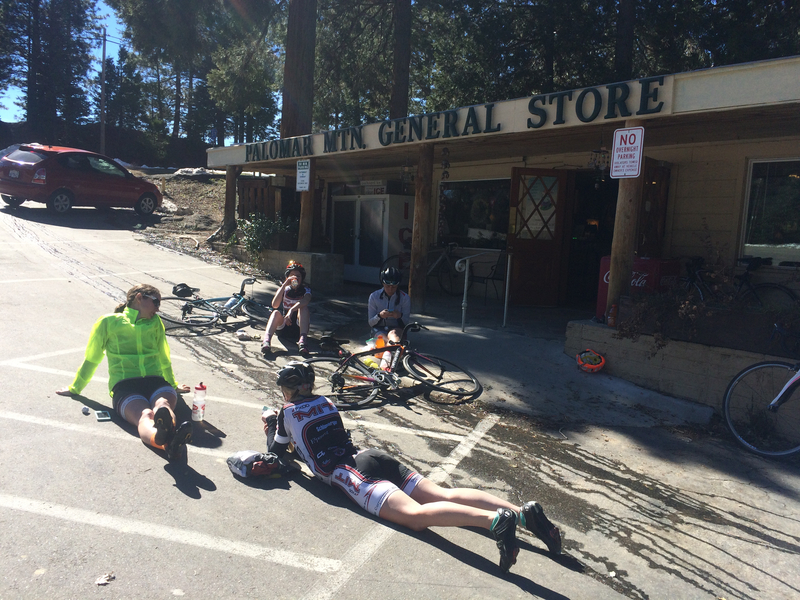 Some of us had a great respite eating quesadillas at Mother’s Kitchen at the top of Palomar Mountain. A few went farther down the road and toured the Palomar Observatory, an incredible research facility with an enormous 200-inch telescope. We also took a few minutes to enjoy the view from the top and took photos like the one below. All in all, everyone had a great time. 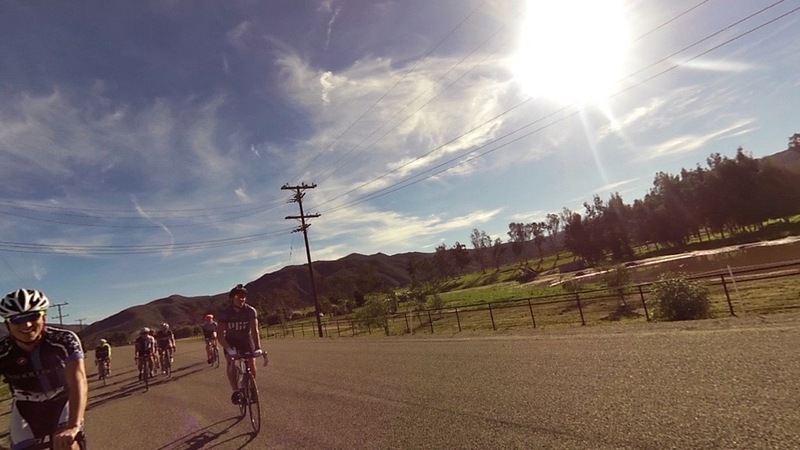 Want to know what one of our weekend club rides can look like? 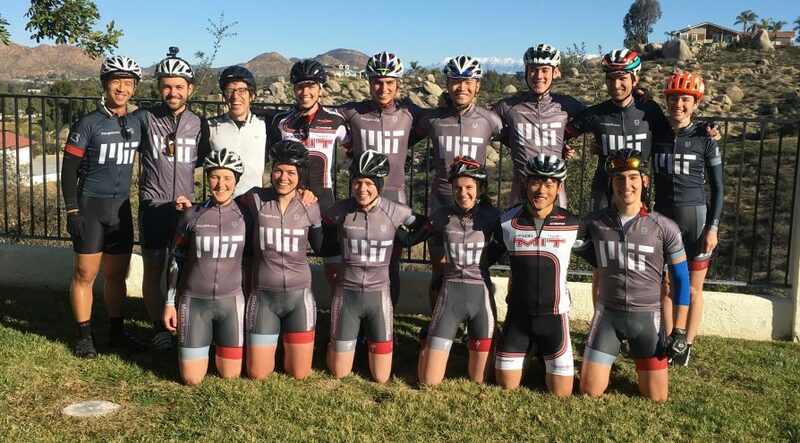 Alex Klotz, a new member of the MIT Cycling Club, put together a cool video using some of Strava Labs‘ features. We started out on a no-drop ride with about 25 people, headed towards Concord. After the first big set of hills, we were pretty spread out and waited for everyone to catch up. One of the riders, Parrish, was going to go on to an apple picking trip after Concord, and wanted to get going at a faster pace, so she, Paul and Felix set off; I wanted to push myself so I joined the faster sub-group. We stopped at the Ride Studio Cafe so Parrish could fix her shoe, and were behind schedule so we booked it to Concord as fast as we could to try to meet up with the main group, covering about 11 km at 30 km/h. We got there and the main group was nowhere to be seen, but a guy was there waiting for them who said he’d been there for half an hour, so we figured they were behind rather than ahead of us. We were surprised, because we were stopped at the cafe for ~20 minutes. Parrish went off to go pick apples, and Paul, Felix and I decided to do the CBTT loop and then head back. We did that, headed towards Cambridge, hoping to overtake the main group from behind, and pretty quickly Felix got a flat tire, which we spent a few minutes fixing. Then we continued, went down Mill St, and got to the far end and had to turn back to the main road. After that we continued home without event. 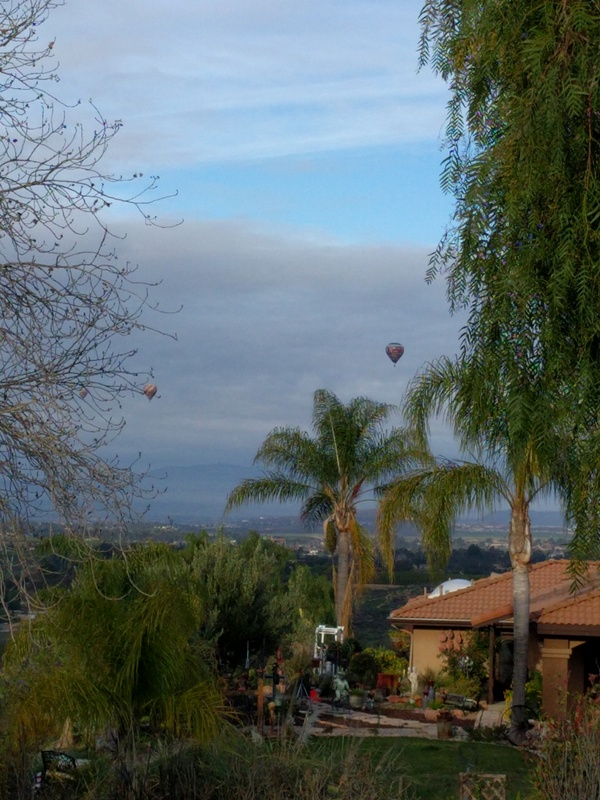 Looking at the Strava flybys afterwards, I saw that we were tantalizingly close to the main group on two occasions. They were delayed because they had tried to go up Mill St and were blocked by the same downed power line that we were, and got within a few hundred meters of us near Marrett St. But the closest we got was at the Concord visitor’s centre. We left when they were within 200 metres, and they arrived two minutes after we left. There’s no way we could have caught them on the way back, even without the flat and the dead-end.